Hollie has a wonderful attitude to her school work and is an enthusiastic helper. Thats awesome Hollie....a great attitude will take you far in life....well done! 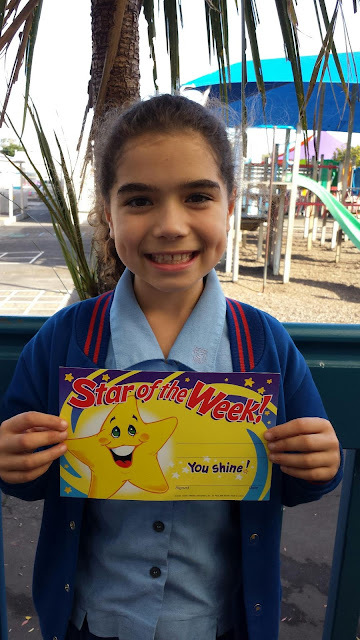 Well done Hollie,you must have a great attitude,and help heaps of class mates to earn your spot as star of the week. WOW!how awesome is that you got the sitifagit of the week for our class well done Hollie. well done Hollie you deserved it!! Well done hollie you must done some great work. Well done Hollie you must of done some great work !!!. Well done Hollie you must be super good. Hollie good job for getting a certificate you must have been a super star to get a star of the week certificate. Is this your first one? Hi Mikala,this IS my fist certificate this year, but I hope I get another one. From your little buddy Hollie. Cool. Has anything exciting been happening in your classroom lately that you really enjoyed. well done hollie good job your awesome.